Grow your cache of quilter's tricks with 5 awe-inspiring patchwork techniques that are easier than they appear. 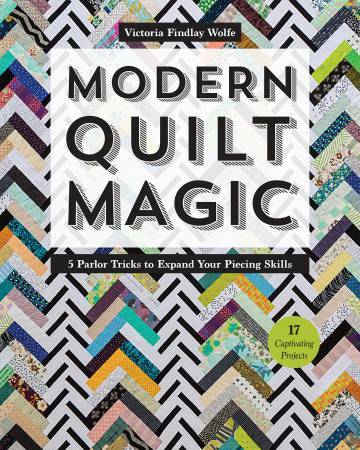 Learn a new piecing trick in just 15 minutes or less, and watch your skills soar to a whole new level. Say "presto!" with partial seams for both quilts and blocks, Y-seams, mini improv piecing, and free-form curves. Victoria Findlay Wolfe shares 17 projects, including the eye-fooling Herringbone and LeMoyne Star quilt patterns, plus full-size templates and 6 quilt coloring pages to help you work your own quilt magic.